299 x 213 mm – Second work: Apostrophe: Raymundi. Barcelona: Pedro Posa, 14 August 1504. Second edition of this celebrated medieval encyclopaedic treatise, the first with illustrations. With: Apostrophe: Raymundi, Barcelona: Pedro Posa, 14 August 1504. First edition. 299 x 213 mm. – I: 182 leaves. With 18 (17 full-page) woodcuts. II: 12 leaves, with title woodcut. 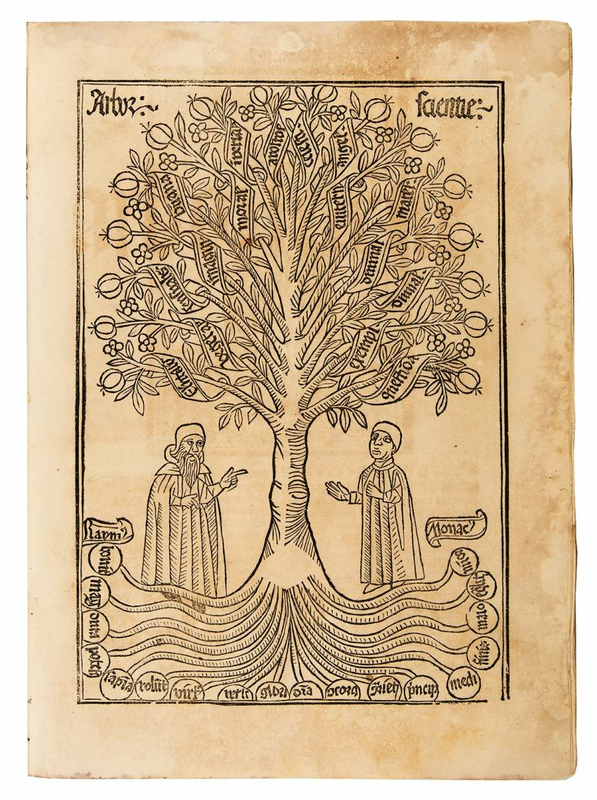 In his Arbor scientiae, the Majorcan philosopher, theologian, and mystic Ramon Llull (1232-1316), classified all human knowledge by dividing it into sixteen categories, each represented allegorically by a tree with roots, trunk, branches, leaves, etc. These constitute a symbolic structure to explain the principles, relations, and levels of reality of each category of knowledge. The categories include, for example, elements, senses, imagination, humanity, morality, law, church, astronomy, and also spiritual subjects such as angels, paradise, hell, the Virgin Mary, Jesus Christ, and theology. In recent years, Lull's reputation has grown among computer scientists, who see his system of logic as the beginning of information science. Hundreds of texts in Catalan, Latin, and Arabic, have been attributed to Llull, but many are not authentic, especially none of the large number of alchemical texts that traditionally circulated under his name. The impressive full-page woodcuts (printed from 5 different blocks) depict the allegorical trees that introduce the chapters. On each woodcut is a large tree, with its roots and branches spread out, bearing scrolls and circles providing space for inscriptions. To each side of the trunk stands a figure, sometimes labelled as Raymond and monk, recalling a typical master-disciple iconography, thus emphasising the didactic purpose of the work.